Facebook finally has made an update today that will allow you to see all (hopefuly) of what we post on Facebook. Here is what you need to do to ensure this new feature works. Step Two: Make sure you click the Like button to follow the page. You may also want to click Get Notifications. 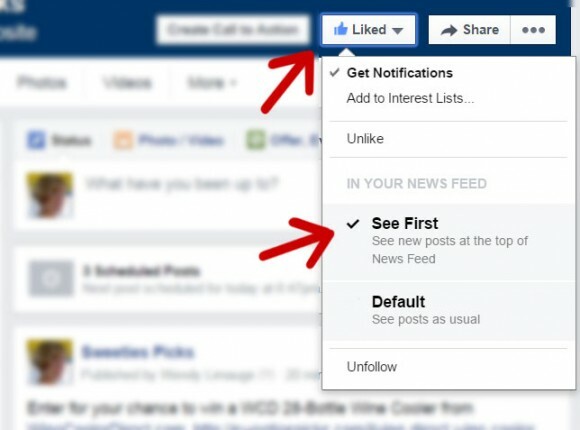 When you comment or like a post on the Facebook page, you will get email notifications when something new is posted or you get a response. Now go to all of the fans pages you want to get updates from and follow steps 1 – 3. This will help to ensure that you never miss a sweepstakes, hot code alert, or reminder again! Now, let’s hope that Facebook doesn’t change it again and that this solves the problem of not being able to see what your favorite Facebook fan pages are posting. Disclosure: this sweepstakes listing may contain an affiliate or tracking link but we do not use referral links. Read about our policies for more details. DO YOU LOVE TO WIN?